Today I added another image to the Trombone History Timeline (17th century, first half)—yet another angel-trombonist. I’ll also be adding it to the HubPages article, Angel-Trombonists Throughout History. Below is the drawing, along with the timeline caption. The artist is actually known primarily for his work as an early art historian. The image looks like it could be a preparatory drawing for a fresco, although I haven’t had any luck tracking down a related painting. 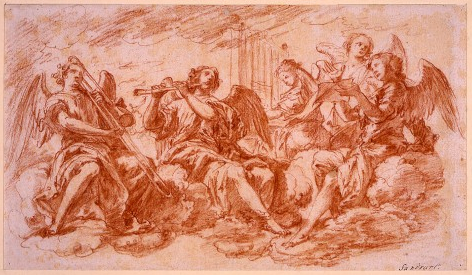 c. 1650—German artist Joachim von Sandrart draws a red chalk “angel concert” that includes a trombone (see below image; public domain) (source: Deutsche Fotothek). ← Baroque Trombone in Color!